This is International Dark Sky Week, an event to help individuals protect the wonders of the night sky. Almost 20 light pollution reports have been posted so far for the Cape Region by concerned citizens. The data shows the night sky is darker in El Sargento and La Ventana as a result of new shielded LED street lights. However, it also shows that some porch and security lights are making stargazing impossible for nearby neighbors. Read about what you can do to make you and your neighbor’s night sky darker below. How To Work With Your Neighbor to reduce Light Trespass, Glare, and Skyglow to Bring Back Dark Night Skies. The star Vega has magnitude (apparent brightness) of 0. Brighter stars — there are only 4 — have negative magnitudes. Dimmer stars have positive magnitudes. A magnitude 6 star is 100 times dimmer than a magnitude 1 star: the greater the magnitude the dimmer the star. For The Globe at Night light pollution reports, only one observer reported seeing stars as faint as magnitude 6 in a very dark sky. This was from a secluded east-facing porch overlooking the Sea of Cortez in El Sargento. But from a west-facing porch at the same location, only a few of the brightest stars could be seen because of a bright security light several hundred yards away. An observer in Los Barriles reported only being able to see a few of the brightest stars in any direction because of unshielded lights on the property of nearby neighbors. These examples show that replacing old, unshielded street lights, while important for overall reduction of light pollution, is not enough to bring back the night at any given home or business location. We should all take the time to walk across the street from our homes and businesses and look back at the outdoor lighting. You should only see the light that reflects off the siding or ground. If you see a bright light, it is trespassing on your neighbor’s property and causing glare, skyglow, two forms of light pollution that do not enhance the property. This page provides information on the basics of good outdoor lighting. This page provides information and tools for working with neighbors to improve outdoor lighting that preserves convenience and security while eliminating or reducing light trespass, glare, and skyglow. There is still a week left to assess night skies as your location and file a report at www.globetonight.org. Follow the instructions below. Continuing nightly through Friday, April 5, we have another chance to submit data about light pollution in our region. This should be interesting to see if there is an improvement since the LED street light installation in La Ventana which directs most of the light down instead of into the sky. Go to the Globe at Night reporting page here: https://www.globeatnight.org/webapp/ . It should be a page record and submit your observation of the constellation Leo the Lion which will be high in the South from 8 to 10 pm. Record the following information on the webpage form. Check or choose maps for latitude 20 degrees N.
Enter the name of your location in the space above the map. Click ALLOW if asked for your location. If the map showing your location is reasonably accurate, put a check in the box below it. Otherwise, click on the map and your location, and then check the box. After you have been outdoors for at least 10 minutes to let your eyes adjust (don’t look towards any outdoor lights or use your smartphone), observe Leo and nearby stars. You can count the total number of distinct stars you see in Leo. It’s OK if some are outside the boundary of the constellation. I found the magnitude maps a little confusing with Leo upside down. Again, check map below for correct orientation. Click on several of the 8 small star maps under the large one until you find the one that matches most closely to what you observed. Counting stars on the map might help. Click on one of the Sky Condition boxes, and enter Location and Sky condition comments. You can include your initials to make it easier to check your report when it is posted on the Globe at Night world map. You can make reports on different nights or different locations. It would be great to have reports submitted from the campground, near street lights, far from lights, Rancho Cacachilas, and other nearby ranchos and towns. Your data should appear on the Globe at Night world map within a few minutes. Click on Baja Sur and zoom in to your neighborhood. Wait a few seconds for a dot to appear, then click on it for a link to your data. Regulus in Leo, about 6 fists above eastern horizon around 8 pm. La Ventana and El Sargento are at about 24 degrees latitude north. That’s 20 degrees farther south than Bend, Oregon at 44 degrees latitude north. That difference in latitude with cities in the north allows us to see stars, star clusters, nebula and galaxies that are still “over the southern horizon” from back home to the north. So while you are visiting the Cape Region, or making this your winter or permanent home, get to know the night sky’s wonders that can not be viewed farther north. Binoculars can help you star hop to faint, deep-sky wonders. If you are comfortable following technical instructions, then looking at the Moon’s craters, Saturn’s rings, and deep sky wonders with a telescope can be an interesting and enjoyable hobby pursued by thousands of stargazers. I find that 8×42, 7×50 , and 10×50 are all excellent for finding deep sky clusters, nebulae and galaxies. Since Earth travels 1.6 million miles a day orbiting the Sun, our view of the stars changes nightly. They rise 4 minutes earlier each night. That’s two hours earlier every month. 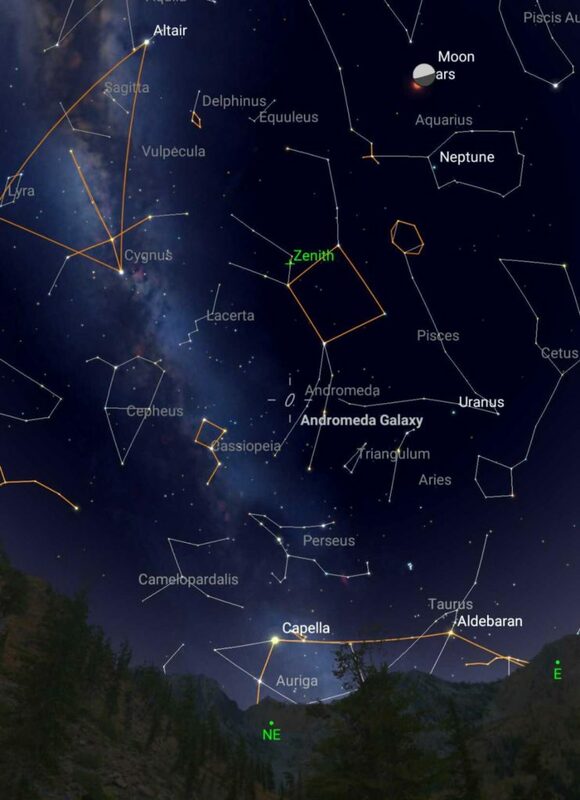 If you have not checked the night sky for a few weeks, there are new constellations to explore. Spend an hour under the stars where both science and storytelling got their start. The easiest way to describe the location of a star or planet is to use bearings and altitude. 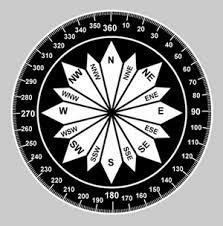 The compass rose below shows compass bearings or azimuth. They are measured in degrees from north clockwise around the horizon. For example due east is 90 degrees. But for stargazing it is easier to be less accurate and use the 16 compass rose bearings. Notice that halfway between N and E is NE. Halfway between NE and N is NNE (North of NE). Altitude is measured in degrees from the horizon (0 degrees) up to the zenith (90 degrees). The angle your fist (thumb on top) spans held at arms length is approximately 10 degrees. That’s about 2 degrees for each digit of your hand. So if Mars is located at WSW, 40 degrees, first locate W and SW ad go halfway from SW towards W. Next hold your fist at arm’s length so the bottom is on the WSW horizon. Put the other fist on top and alternate fists until you have measured up 4 fists. This should get you close to your target. The Star Maps below are for a given time and date. Stars on a map for 9pm on January 1 will be farther west at 9pm. A month later they will be in the same location 2 hours earlier at 7pm. If a map does not appear like the night sky when you are out observing, look higher or lower in the sky, and for the same constellation turned at a different angle. There are many free apps for smart phones and tablets that make finding and identifying stars, planets and deep sky object much easier. The maps on this page are from Sky Safari 6 Plus, about $15 at online app stores. But don’t become dependent on an app. Sit down before going outside and bring up the night’s sky for the time you will be outside. Check where things are. Locate a list of best things to observe. Bring up information about the history and science related to your observation. Memorize a few names. The put your phone in your pocket and go out and test yourself. Soon you will be comfortable without referring to maps or phone. 2. A crescent 1-2 day old Moon setting soon after sunset in the west. 3. Terminator of Moon through Copernicus or other crater during sunrise on the Moon 9 days after New Moon to see mountain tops illuminated. 4. The five naked-eye planets: Mercury, Venus, Mars, Jupiter, and Saturn. 5. The moons of Jupiter on successive nights showing their movement. 8. Ten brightest stars in the night sky: click here. 11. Thuban in tail of Draco, North Star during building of Pyramids. Phecda and Megrez in bowl of dipper point to Thuban. 14. Alpha Centauri, star system closest to our Sun. Along with Hadar (Beta Centauri) they point to the top of the Southern Cross. 20. Betelgeuse, left hand or Orion, ready to go supernova any time soon. 42. A super nova in our galaxy ( Average of 1 every 50 years. Last visible one Oct 9, 1609. We are overdue). About 1 a year are spotted by telescope in other galaxies. Summer constellations are setting in the west during early evening. Winter constellations are just rising in the east. October is also a good month to look for meteors. There are several different meteor showers, but on any evening you are likely to spot a few bright ones shooting across the sky. Go outside by 7:10pm to let your eyes adjust to the darkness. Can you see the constellation Scorpios the scorpion with red Antares at its heart and its head pointing at Jupiter? Saturn, in the SW, is just to the right of the up-tipped teakettle asterism in Sagittarius. The Ptolemy Star Cluster is a good test for your eyes in dark skies. Look for it between the stinger of Scorpius and the teakettle’s spout (see maps 7a-b below). Averted vision helps (see Star Gazing Fundamentals below). The Butterfly Cluster is above and to the right of The Ptolemy Cluster. Binoculars help. Look for other clusters in both constellations. Very red Mars is high in the south. The faint elliptical glow of the Andromeda Spiral Galaxy in the SW is 2.5 million light years outside of our galaxy (see maps 3 and 10 and detailed explanation of how to find it in December’s summary below). High overhead look for the giant Summer Triangle with bright stars Altair, Deneb and Vega (brightest of the three) at the corners. For early risers, there is a lot to see from 5:30 to 6:30 am . 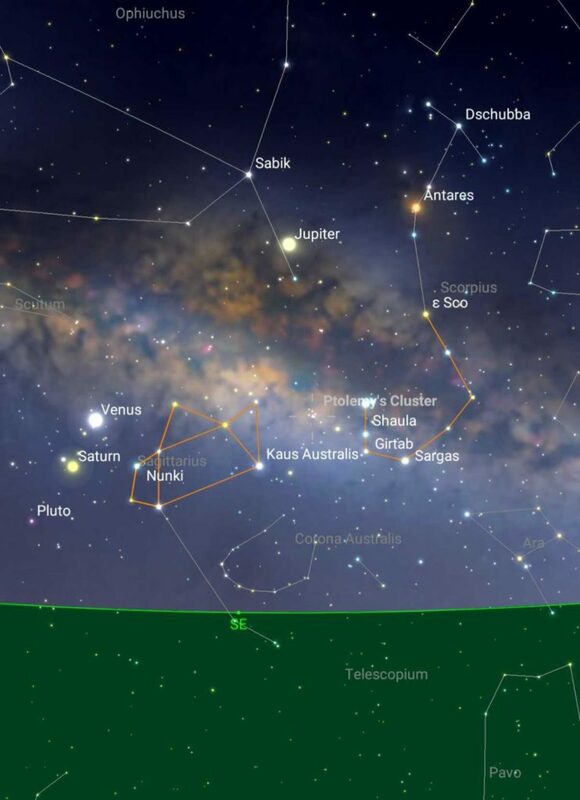 High in the south the Winter Circle of 6 constellations is anchored by Sirius, the night sky’s brightest star (see map #1 below). And below it near the horizon is the second brightest star Canopus. In the NE the Big Dipper is standing on its handle over Isla Cerralvo with Leo the Lion anchored by the bright star Regulus just to its right in the east. . Look to the NNW for Cassiopeia’s M shape with the 3rd and 4th star from the bottom pointing up at the faint Double Cluster . 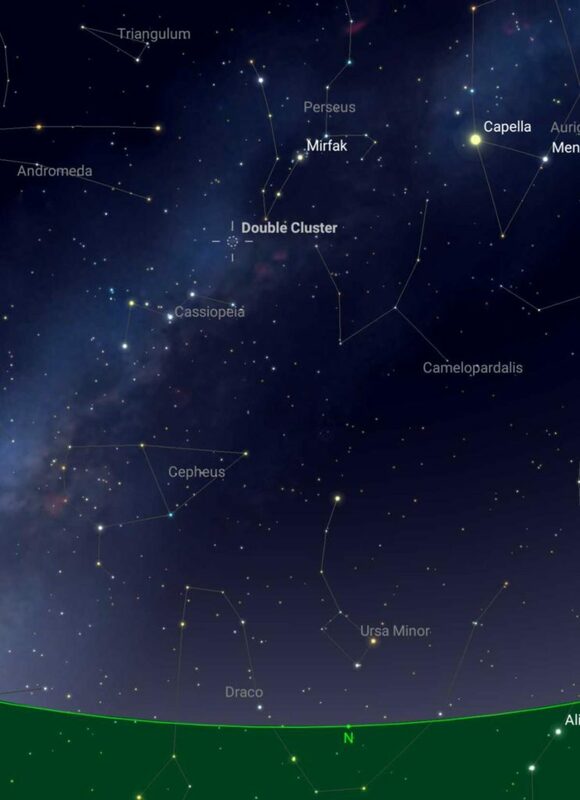 Use averted vision or binoculars to spot the Double Cluster between Cassiopeia and Perseus. See map #4. Early Morning: Go outdoors around 5:30 am. Look NE for the Big Dipper standing vertically on its handle over Isla Cerralvo. The two pointer stars its bowl, Merak and Dubhe, point to Polaris, the north star. In the south, Sirius, the brightest star in the night sky, is high above Canopus, the second brightest star. The Winter Circle (or hexagon) is high in the southwest. Start at Sirius and go clockwise to find Procyon, Pollux& Castor, west to Capella, then down to Aldebaran, back east to Rigel, and finally end back at Sirius. Of course that is the constellation Orion standing on the star Rigel. Evening observers should be outside by 7pm. Directly south is the star Fomalhaut (pronounced Foam-a-lot). It is a loner with no other bright stars nearby. Using indirect methods, Astronomers have recently discovered many exoplanets orbiting other stars. But the one orbiting Fomalhaut is the first discovered directly from a photograph. Overhead between about 7 and 9pm floats the Great Square of Pegasus. Not far to the north of its bright NE corner is the Andromeda galaxy, our nearest sister galaxy visible from the northern hemisphere. It forms a large, faint spiral that is easy to spot with binoculars in a dark sky. Scan slowly back and forth as you move north from the corner of the Great Square. One of the best meteor showers of the year, the Leonids, hits earth’s atmosphere late on the evening of the 17th up to dawn the following morning. While most Leonids shower 50 or so meteors per hour, the great meteor storm of 1949 1000 or more meteors per minute. The shortest day of the year is the winter solstice, around December 21, when the sun rises, transits, and sets furthest south in the Northern Hemisphere. While it is the shortest day of the year, it is not the day of the latest sunrise or earliest sunset. For reasons related to Earth’s tilt, elliptical orbit, and increasing speed as it orbits closer to the sun than average during our winter, the earliest sunsets occur early December, and the latest sunrises occur early January. The winter solstice is the day to check noontime shadows. The sun’s low path across the sky casts the longest shadows of the year. Use them to position your kitchen garden or other sun-loving plants. The Geminids Meteor Shower begins Saturday evening, December 13 and continues until morning. Most meteor showers are caused by tiny debris from comets. The Geminids come from a rocky asteroid with a comet-like orbit. As the asteroid passes close to the sun every 1.46 years, thermal fracturing sheds rocky chunks into the asteroid’s orbit. When Earth crosses this orbit, chunks entering our atmosphere burn as bright fireballs. They tend to come in groups, so be patient if you go out to watch for them. 4) Orion returns in December, another sign of approaching winter. 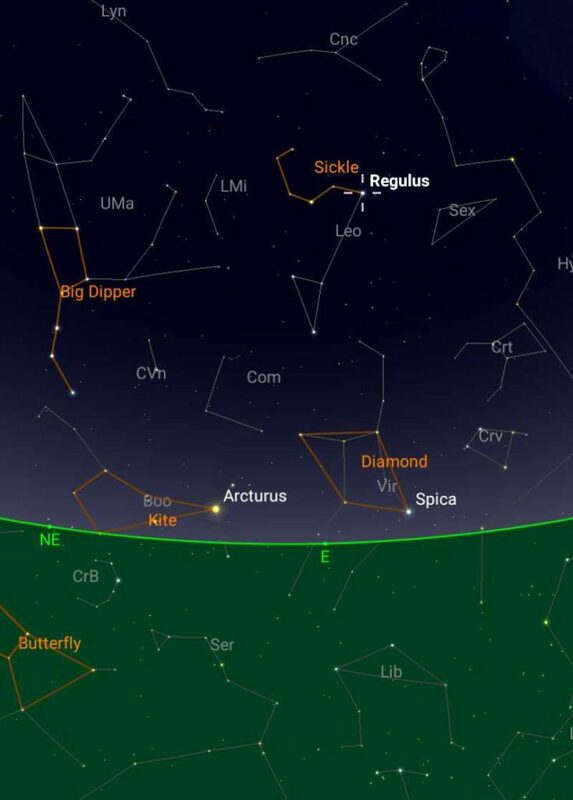 Look for the hunter climbing the SE sky around 10pm, 9pm mid month, and 8pm by month’s end. 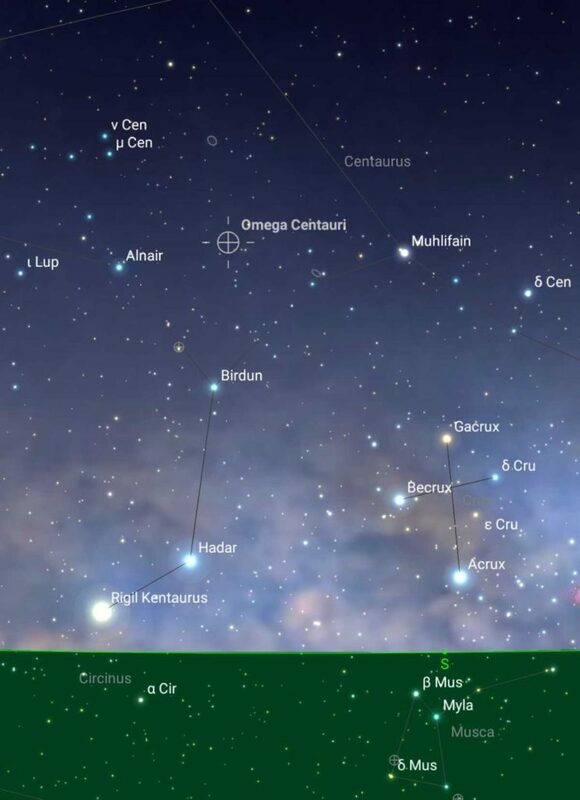 The group’s brightest stars, Betelgeuse and Rigel, are at opposite corners. Sirius, the brightest star in the sky, shines just below Orion. Dec 20 Sunset is around 5:37 pm. Recall that if there are mountains to your west sunset will occur around 15 minutes earlier; the same for moonset times. So sunset Wednesday evening is 5:37/5:22 pm depending on your view to the west. Find a dark location shielded from outdoor lights by 6:50pm. 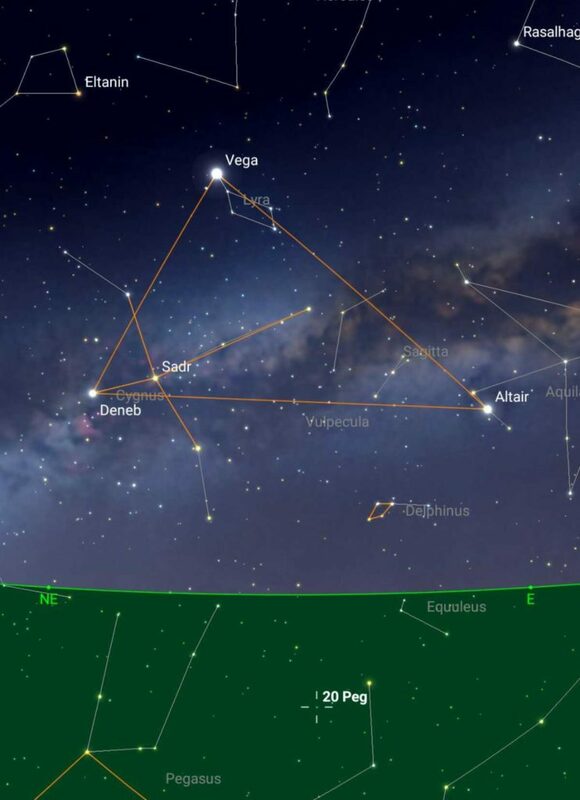 While your eyes are adjusting to the dark, look for the 5th brightest star, Vega, setting in the NW. Altair to its upper left and Deneb above form the Summer Triangle. Capella, the 6th brightest star, is in the NE over Isla Cerralvo. The constellations Orion and Taurus are rising in the east. Betelguese (reddish) and Rigel (blue-white) are the two brightest stars in Orion. Orion’s three belt stars points up to red Aldebaran in V-shaped Taurus the Bull. It’s the 13th brightest star in the night sky. Can you pick out 6 or 7 of the stars that make up the Pleiades a fist or so above Aldebran? They also form the logo you see on Subaru autos. Polaris, the North Star and 48th brightest star, is 2+ fists above the northern horizon. 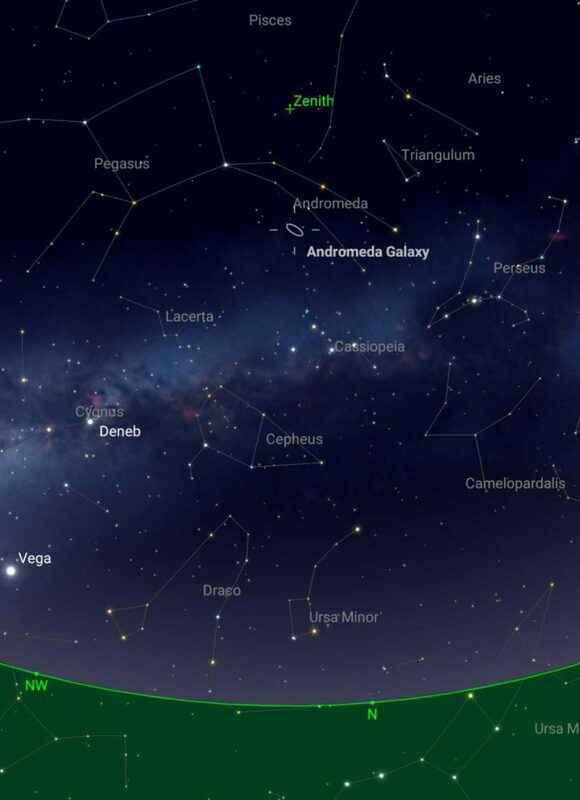 Finding the Great Andromeda Galaxy With Binoculars: Dark skies provide a chance to spot the most distant object possible with the naked eye at 2.5 million light years. Around 7:30 find a dark location shielded from outdoor lights and wait for your eyes to adapt to the dark. The Andromeda Galaxy is our nearest neighbor outside our home galaxy, the Milky Way. Light from Andromeda begins as photons created by nuclear fission at the centers of the galaxy’s 200 billion+ stars, then travel for millions of years to reach Earth. Search from 7:40 to 8:00. First find the North Star. It’s not the brightest star in the sky, but easy to find standing alone 2.5 fists above the north horizon. Look three fists above Polaris for Cassiopeia, the constellation whose 5 brightest stars form an M. The second and highest star from the left is Shedar. A line from Polaris up to Shedar and extended another 1 ½ fists ends at Andromeda. Look for a fuzzy patch of light the size of the moon. It helps to use averted vision, turning your eyes slightly to one side so that photons from Andromeda strike the night vision part of your retina. Binoculars make the galaxy easier to find. Don’t give up. It may take a few minutes to collect enough photons for your brain to put Andromeda’s image together. The brightest stars of winter form the famous Winter Circle, a giant oblong hexagon of bright stars now in the eastern sky. Best viewing is from 8 to 10 pm. Start with Sirius, brightest star in the night sky, rising low in the SE. Sirius is close at only 8.6 light years. Move clockwise to Procyon, 8th brightest star in the night sky, due east and the same altitude as Sirius (from 8-9pm). Slightly higher moving clockwise are Pollux & Castor at the next corner of the hexagon. Pollux is the 17th brightest star. High above Pollux & Castor is Capella, 6th brightest star. Now swing back south (to your right) to the giant red star Aldebaran, 13th brightest star and eye of Taurus the Bull constellation. The famous Pleiades star cluster is about a fist+ above Aldebaran. People with good eyesight can make out 8-10 of the clusters brightest stars. Continue right and down to Rigel, one foot of Orion and 7th brightest in the sky. Rigel is a young blue-white star. To Rigel’s left is the giant red star, and shoulder of Orion, the 9th brightest star Betelgeuse. It’s big and living a fast life. Once it has burned up it hydrogen fuel it will explode into a nova and be the brightest star in the sky for a short time. At a distance of 500 light years, the explosion should not affect Earth. From Rigel down to Sirius completes the trip around the Winter Circle. See that bright star rising in the SE? That’s Canopus, 2nd brightest star in the night sky. Since it is far from the plane of the bright planets,the ecliptic, it is used by spacecraft for navigation purposes. With 100 billion or more stars in our galaxy, with naked eye we can only see about 10,000 of the closest and brightest ones during a year’s trip around the Sun. While astronomers have assigned coded letter and numeral designations to several million stars, only 313 of the brightest or most interesting actually have names. Most are ancient Arabic, Greek or Latin such as the ones named above. But 86 were recently added to the named stars by the International Astronomical Union. All of these have names from other cultures such as Chinese, Polynesian, and Aztec. During a spur-of-the-moment star gazing session with a friend we were looking overhead at the M-shaped constellation of Cassiopeia. Suddenly he remarked that he could see a cluster of many faint stars just above the last two stars on the right side of Cassiopeia’s M. He was using averted vision, the more sensitive periphery of the retina rather than the color-sensitive center we use during the day and for fine detail work. He had spotted the famous Double Cluster in Perseus, two adjacent clusters of young stars, more than 300 all together. They were first cataloged in 130BC by the astronomer Hipparcos who must have also had superior vision. They are spectacular through binoculars or on low power through a telescope. And a great naked-eye test for your night vision. At around 7:00-7:30 pm for the next couple of weeks, you can look for the clusters more or less above the North Star about 5-6 fists above the horizon. January’s Before-dawn Sky — Finding the Southern Cross and its neighbors. 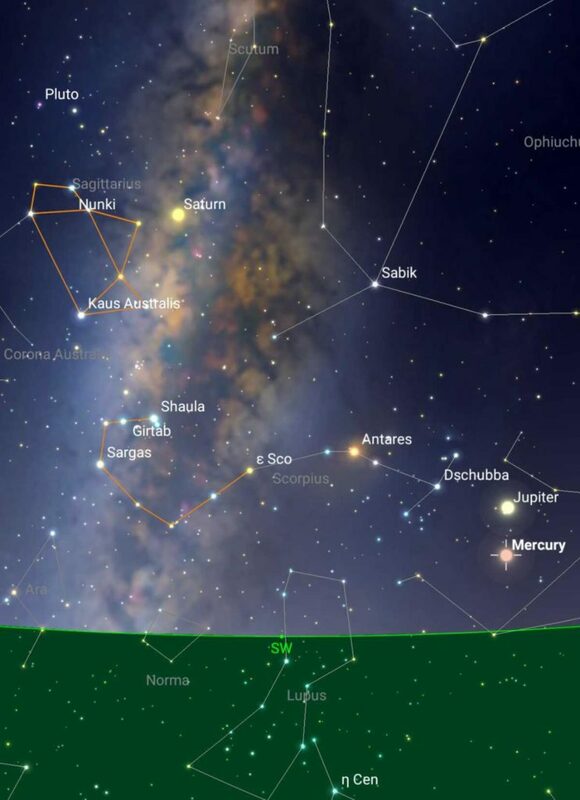 The Southern Cross is visible here in the Cape Region from about January 15 to June 15. The best time to look is when it is highest, within half an hour or so on either side of due south. It is very low on the horizon, the bottom star of the cross only a finger or two above the mountains. When directly in the south, the Cross stands more or less upright. There is a false cross low in the south 4 hours earlier that is on its side. As we orbit the sun, we see the same stars 4 minutes earlier each night. In a month that adds up to two hours earlier. So since we can see the Cross at 5:45 am January 15, in 4 months it will be visible 4 x 2 = 8 hours earlier at around 9:45 pm on May 15. That is why the local Mexicans call the Southern Cross La Cruz de Mayo. To find the constellation’s 4 brighter stars in January, go outside by 5:30 am. You will need a dark location with a building or other object blocking the street lights of the town. By 5:45, two bright stars on the SSE southern horizon point west a fist+ at the bright star at the top of the cross. The left crossbar star is also relatively bright. The other two stars of the Cross are dimmer. The pointer stars are (on the left) Rigil Kentaurus (Alpha Centauri), the closest star system to us, and Hadar. Alpha Centauri is the 3rd brightest star in the night sky and less than 4 light years away. To find Omega Centauri, the largest of 150 globular clusters orbiting the Milky Way, start at the right pointer star Hadar. About 4 fingers above Hadar is the next naked eye star called Burdin. Extend a line from Hadar through Burdin and extend it about 3 finger widths. Using averted vision, scan this region watching for a faint round cloud. Use binoculars for a more impressive view. At 15,600 light years, the cluster, even with 5 million stars, is too distant to make out individual stars through binoculars. Globular clusters are compact collections of very old stars just outside the Milky Way. Open clusters are groups of young stars recently formed from giant molecular gas clouds inside the Milky Way. The Jewel Box is a sparkling open cluster of young stars of varying colors. Start at Becrux, the left crossbar star of the Cross. Scan down to the 7 o’clock position about 1 finger width. Just below the Jewel Box there is a large dark area of no stars caused by a giant cloud of dust blocking star light. The cloud is known as the Coal Sack. But it’s as big as the promise, the promise of a comin’ day. 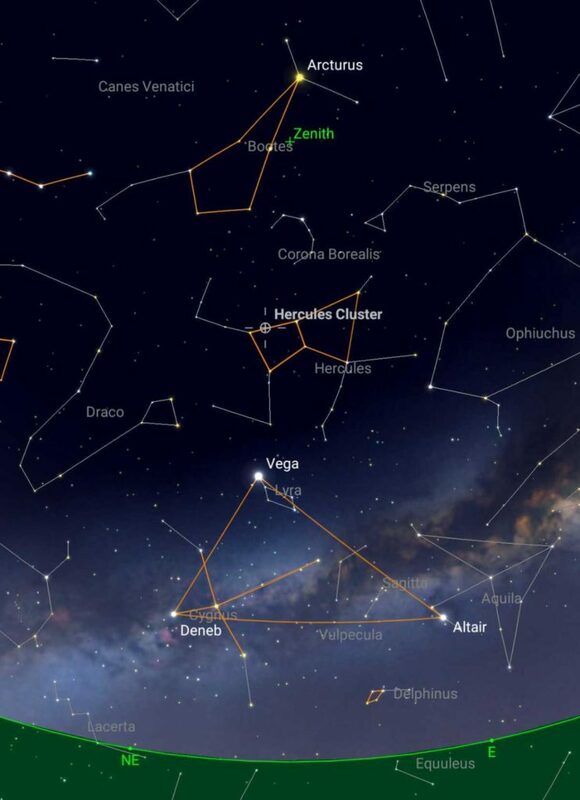 Early February Night Sky — The Stars and Myths of Orion: The brightest constellation in the night sky, Orion, is easy to find during February evenings high in the southeastern sky. 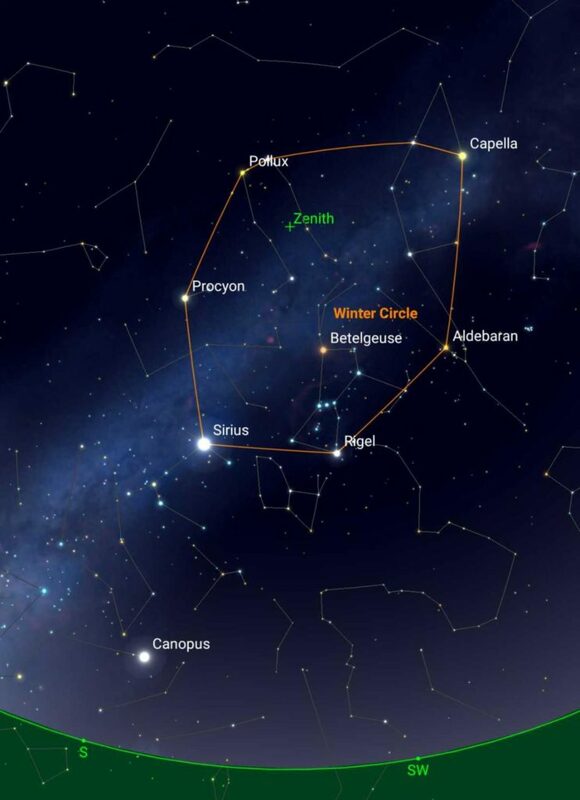 It is one of the six constellations lying on the Winter Circle. The red giant Betelgeuse (upper left) along with the bright blue-white star Rigel (lower right), and the three equally spaced stars forming Orion’s belt make the hunter constellation easy to identify. But there is a lot more going on in this constellation than meets the eye. Stars are born, live anywhere from a few million years to billions of years, and die, some with a whimper and others with a bang. And it’s all happening in Orion. Stars are being born now in the famous Orion Nebula. With binoculars or a telescope, you can see the greenish hued cloud of gas & dust surrounding some of the middle stars of Orion’s sword which hangs beneath his belt. This giant cloud of mostly hydrogen, with heavier elements such as silver and gold that were created by earlier supernovae, is collapsing under the force of gravity. This has already produced the pressure and heat necessary to ignite thermonuclear fusion in denser pockets of gas, releasing massive amounts of energy as described by Einstein’s famous equation E = mc^2. The Trapezium is a group of newly born stars at the center of the Nebula. Just last year, the Hubble Space Telescope found more than 17 new brown and red dwarfs in the nebula. Brown dwarfs are bigger than planets but so small they never warm up enough to go nuclear. Red dwarfs have ignited but because of their size are difficult to detect. They are probably the most numerous stars in our galaxy. Rigel represents Orion’s left foot (but from our perspective at the lower right). It’s living a fast life and has already turned all its hydrogen into helium. At only 8 million years, it is younger than some of our earliest human ancestors. Its small size (compared to Betelgeuse) leaves uncertain as to whether it will explode as a supernova or collapse into a super-dense Earth-size neutron star. Betelgeuse, on the other hand, could go supernova at any time. It’s low on fuel. When gravity overcomes the outward pressure of fusion energy, the giant star will collapse in seconds creating a super fusion bomb that will create the heavier elements and blow them all back out into space for inhabitants of some future Earth to use in jewelry making. I hope I’m around when it happens. No worry. It’s too far away to endanger our planet..
You may be familiar with Orion in Greek mythology. The warrior bragged he could kill all the animals on Earth. Gaia sent the scorpion to sting Orion’s heel and kill him. Zeus rescued Orion and placed him in the sky. But fearing the scorpion, Orion only rises in the east after Scorpius has set in the west. For the Pericu Indians of the Cape Region, the three stars in the belt of Orion represented the stones their God Niparaya used to descend from heaven onto Cerro Puerto, the highest peak to the west of El Sargento. From there, Niparaya created humans and all the plants and animals they would need to survive in happiness. Incidentally, the stars in the belt are only 5-6million years old. There are older rocks in your back yard. Orion’s belt has other uses for star gazers. It points down to Sirius, brightest star in the night sky, and up to Aldebraran, the eye of Taurus the bull. Spend an evening with Orion. Explore the region with binoculars. Two sides of the Winter Hexagon are formed by lines connecting Aldebraran to Rigel and Rigel to Sirius. Can you trace out the other four sides? Mid February Baja Night Sky — Sirius, Canopus, Regulus, Big Dipper, Southern Cross, Scorpius. 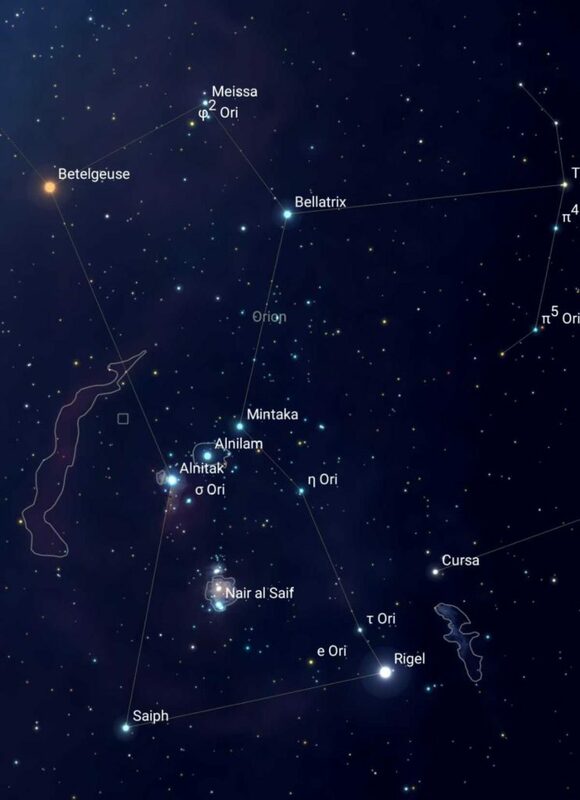 By 8 pm the constellation Orion is high in the south. You probably know that the three belt stars point down to Sirius, the brightest star in our night sky. Canopus, the second brightest star in the night sky has been up for about an hour. It is twinkling several colors far below Sirius at the 5 o’clock position. Turn around and face north and see if you can find the bowl of the Big Dipper rising over Cerralvo in the NE. By 9pm the Dipper’s handle is visible. Three stars make up the Dipper’s handle. The middle star at the bend in the handle is Mizar, the first star to ever be photographed. If you have good eyesight you should be able to see that Mizar is a double star. Look for its companion, Alcor, close by at the 7 o’clock position. Mizar and Alcor are themselves double stars but you need a spectroscope to detect their companions. You know the last two stars in the bowl point to Polaris, our current North Star. Use the same two stars to point in the opposite direction, east, and the first bright star you come to should be Regulus, the star at the bottom of the Sickle in the constellation Leo rising in the east. The entire constellation Scorpius, with Antares at the scorpion’s heart, is now high in the SE. With binoculars there are clusters to find just east of the stinger. First spot them with the naked eye, then with binoculars. Below Saturn is the famous Teakettle asterism in the constellation Sagittarius. The handle is on the eastern edge, the top just below Saturn, and the spout near the stinger of Scorpius. Surrounding the Teakettle are many globular and open clusters waiting for you to discover with binoculars or telescope. Before Dawn: Between 4:30 and 5:30 am, the constellations Scorpius and Sagittarius hang in the SE morning sky. Scorpius is the J-shaped “scorpion.” To its left is Sagittarius the archer. However, within Sagittarius is a teakettle asterism. The handle is on the left, tipping the spout on the right slightly upward. A bright star marks the conical top of the teakettle’s lid. Within the region of these two constellations there are a dozen or so open star clusters (nearby small groups of recently formed stars). There are another dozen or so globular clusters (compact globes of a few hundred thousand to a few million ancient stars orbiting around the outside of the Milky Way Galaxy).There are also a dozen or so nebula (giant clouds of gas just beginning to form stars). In a dark morning sky away from offending outdoor lights, you can spot many of these wonders by sweeping the area with binoculars. Give it a try. There are 88 modern constellations recognized by the International Union of Astronomers, including around 48 groupings of stars described by the ancient Greeks. Most of the newer ones can only be seen from the Southern Hemisphere. There are many asterisms, easily recognized patterns of stars, such as the Southern Cross and the Big Dipper, that are a part of one or more constellations. Many asterisms have geometric shapes, and probably inspired ideas we all learned in geometry. One of those is the large Winter Triangle with stars from three different constellations. This week, between 8pm and 10pm, when you are facing south, the Winter Triangle is high in the sky, Its bottom star is Sirius, brightest star–not planet–in the sky. It’s just below the constellation Orion. To the upper left of Sirius is Procyon, a corner of the Winter Hexagon asterism. To the upper right of Sirius find Betelgeuse, the red star at the right shoulder of Orion (left facing Orion). In your mind’s eye, connect straight lines from Sirius to Procyon to Betelgeuse and back to Sirius. That’s the Winter Triangle, an almost perfect equilateral triangle. Remember her? Equal sides imply equal angles, and an altitude to any side creates two 30-60 right triangles with hypotenuse twice as … I’m sorry, I just can’t help it. Some other asterisms are kites, sails, teapots, DNA strands, fish hooks, and squares. Go out tonight and find yourself an asterism of your own. 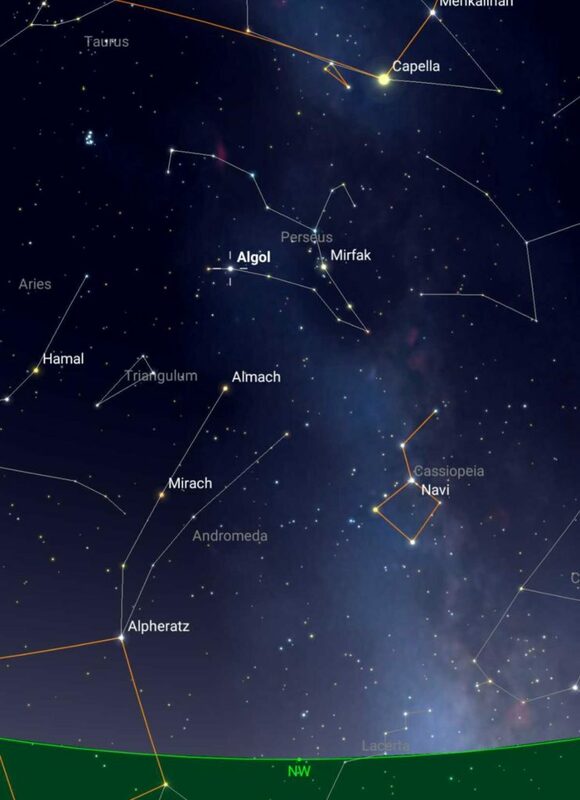 ● Seven of the ten brightest stars in the sky are visible during March evenings. Here they are in order of brightest: 1) Sirius: Orion’s belt points to it. 2) Canopus: Below Sirius. 4) Arcturus: Follow the arc of the Dipper’s handle. 6) Capella: High in the WNW. 7) Rigel: Bright knee of Orion. 8) Procyon: High above Sirius. 10) Betelgeuse: Red Giant star in Orion that could go supernova anytime. Look high in the south for Orion the hunter, one of the brightest and most easily recognizable constellations in the night sky. The three stars in Orion’s belt point down towards Sirius in the constellation Canis Major and up to Aldebaran in Taurus the Bull. When you’ve found Sirius, brightest star in the night sky, look for Canopus, the second brightest star, which is far below Sirius near the horizon. Two fists to the left of Canopus is the False Cross lying on its side. As described below, when the true Southern Cross is over the south point of the horizon it stands upright. Once you find Sirius you can go clockwise around the Winter Hexagon (also known as the Winter Circle ) of 6 constellations. From Sirius go to Procyon in the two-star constellation Canis Minor, then to the stars Pollux and Castor in the constellation Gemin. The next corner, Capella, is overhead in the constellation Auriga,. Now trace down to Aldebaran in Taurus. Now go to Rigel, the right foot of Orion, and then close the hexagon by returning to Sirius. Hidden in these 6 constellations are deep sky objects such as open and globular clusters, the remains of exploded super novae, galaxies and giant clouds of hydrogen. 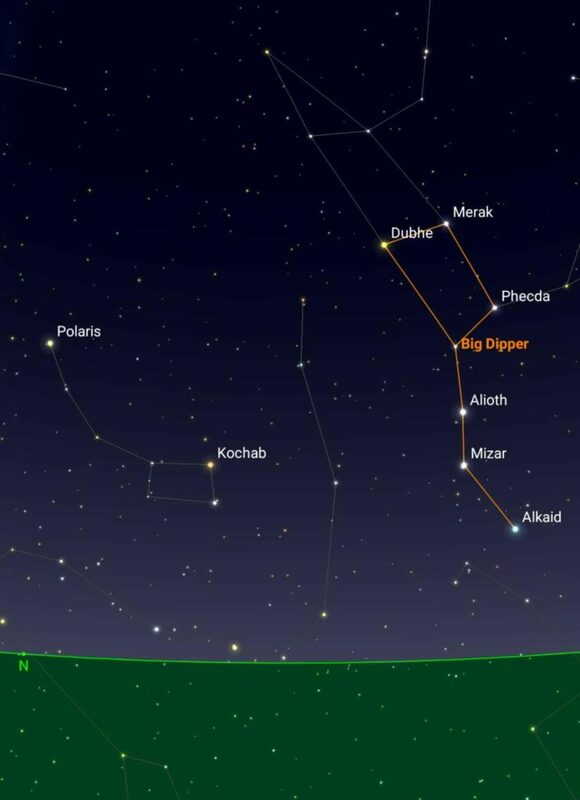 If the sky is now dark enough to see the Big Dipper back in the north, follow the arc of its handle down to Arcturus, 4th brightest star in the night sky. It is just rising over the southern end of Isla Cerralvo. To see the Southern Cross and nearby globular cluster Omega Centauri, go out at 12:15 am when the Cross is standing upright just above the mountains in the south. 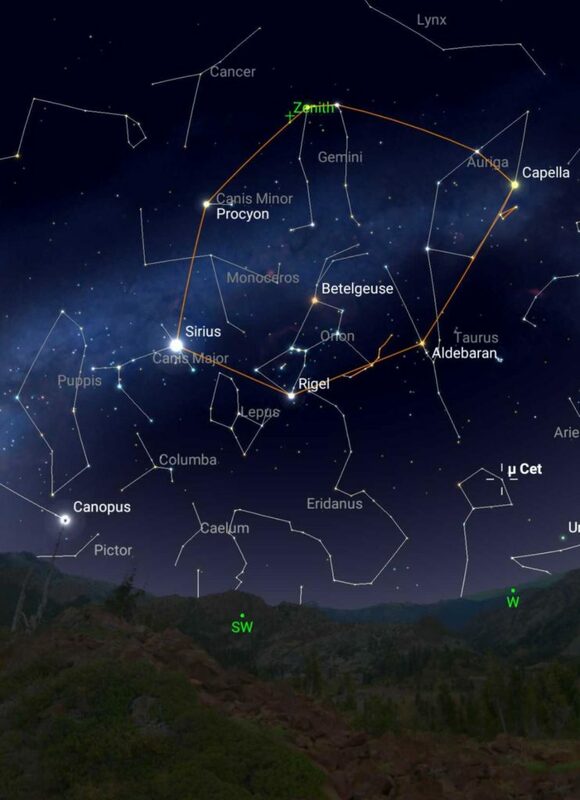 For directions to finding Omega Centauri with binoculars, read Baja Night Sky #119 below but use the 12:15 am time. The teakettle-shaped asterism of 8-9 bright stars below Saturn is part of the constellation Sagittarius. Can you spot it? It is tipped as though pouring boiling water onto the stinger of Scorpius the scorpion. Between the spout and the stinger is the beautiful Ptolemy cluster of relatively young stars. It’s a fuzzy patch to the naked eye, but 100 or more sparkling stars through binoculars. The Butterfly Cluster is just above it. This region is near the black hole at the center of our Milky Way Galaxy.